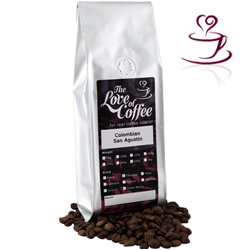 Flavour: Rich flavour, fruity body with a rich aftertaste and a slightly nuttier flavour to most other Colombian coffees. Grown in the Andes mountains near the source of the Magdalena River, shaded by bananas and tropical trees. Stone idols from bygone civilisations can be found in the plantations. This perfect setting produces a mild Arabica coffee. The cherries are handpicked by families of coffee growers who sell direct to control quality and purity. They are transported across the Andes Mountains to San Agustin to the milling plant. From here they are shipped from Buenaventura on the Pacific coast. Great product, great choice, great value. Good selection of coffee and order delivered on time. I love The love of coffee the order is always fresh and fast delivery, would recommend. 2 Colombian coffees are very good. San Agustin is a favourite and always on the order. Excelso 1st time and is a great coffee and will order again. Great choice of coffee with detailed information. Speedy delivery as ever. Thank you for your prompt delivery of my recent order. I chose eight coffees as a gift for my wife. She has been pleased with the first two she has sampled and is looking forward to trying the rest! Many thanks. I came across The Love of Coffee when I searched for an online supplier of high quality coffee about 15 months ago. Since then I have ordered a variety of coffees regularly, for me and for friends. The quality of the coffee is outstanding. The beans are sourced from several countries and from ethical producers. The services in relation to the deliveries are excellent. If first class post is ticked then the coffee arrives during the next day; if second class post is required then the coffee comes on the second or third day. The packaging is airtight so that there is no loss of quality while the products are in transit. I shall continue to use The Love of Coffee regularly and frequently for all of the family's requirements. Outstanding service, great quality of coffee at reasonable prices throughout the listings. It was very easy to place my order, and my coffee arrived very quickly. I will be ordering coffee from this website again. High quality coffee with a matching service. Will use again. The dispatch and delivery service was excellent - the beans being delivered well before the appointed day. The Love of Coffee packaging was also excellent - the beans were fresh and strong smelling. Can't fault anything from this on-line supplier....I can recommend them and will certainly be buying from them in the future. Excellent choice and excellent service. Already recommended to my family and friends. Will be buying all my beans from here in the future. Excellent quality and hassle free purchases. Came highly recommended and I've not been disappointed! Excellent service. Prompt delivery and first class product.